Today’s article is a lightly updated revision of one that appeared on November 3, 2016, when an earlier “pre-election” version of the same ad was running. The hints about individual stocks are the same in the ad today, as is much of the rest of the language, though back then it was an urgent “pre-election” push and now Ray Blanco is pushing this as something that requires action by July 1. I’ll post some charts about how the stocks have done at the bottom (and yes, a couple of these stocks were closer to being guesses, given the limited clues). What follows has not been updated since early 2017, though we’ve checked to see that the clues in the ad that’s circulating now remain unchanged so our answers, including guesses, remain the same. I’ve left all the original comments appended, some of which suggest better possible answers for your consideration. I’m a little bit of a fuddy daddy when it comes to marijuana stocks — not because I’m necessarily against legalization or recreational use by adults, but because I don’t like being in the middle of wild stock bubbles where there’s no rational justification for valuations. With that buzzkill out of the way — what is the secret “$50 marijuana stock blueprint” that Ray Blanco is selling as a way to get subscribers to his Technology Profits Confidential newsletter? Let’s dig in and see what they say. The “$50 Blueprint” part is a taste of absurdity, that’s based on his “Real Life Example” of how you could have turned $50 into $2.7 million using a few pot stocks — that’s one of the ridiculous penny stock chains you see touted every now and again, where $50 turns into $1,300 in a few months because you ride one explosive marijuana stock, then turning that $1,300 into $40,0000 on another pot stock that jumped by 3,000%, then put that $40,000 into one final stock that jumped by 7,000% in a few days and presto! It turns into $2.7 million in a little less than two years. He does make a point of saying, “Although it’s improbable you’d ever ride a profit wave just like this, it’s NOT impossible…” but that doesn’t really mean anything. It’s also “not impossible” that you’ll win the billion-dollar Powerball lottery, but it’s awfully close to impossible. And with that, he’s already planted the idea of ridiculous riches in your head… so, as the ad copywriter wants, you’re drooling a little bit and primed to get out your credit card. The real driver of all of this chatter about marijuana is the notion that marijuana production, retailing and consumption will create a much larger marijuana industry, and that the growth of this industry will allow some companies to flourish. Since legalization started out small and risky, the companies are pretty much all tiny — and a great many of them are private… but there are also hundreds of publicly traded stocks that have some connection to marijuana… almost all of them are penny stocks that trade over the counter, including those that change their corporate focus anything there’s a new hot stock market sector… though there are a few larger ones, mostly biotech companies that have been around for a while and are trying to develop drugs that are derived from or somehow related to cannabis (which, as I’ll reiterate, means legalization doesn’t mean much for them — they’re generally using marijuana as a raw material source for drugs that are in clinical trials, not trying to sell marijuana itself). And yes, the legal marijuana business is becoming larger — five states had recreational marijuana votes on the ballot, and it won everywhere but in Arizona, so Massachusetts, California, Nevada and Maine now are legalizing recreational possession and use to at least some degree, and probably adding to the tipping point that forces a real change in federal law and more easing from other states in the future… if only because California tends to lead the nation and swing a big stick thanks to their gigantic population (medical marijuana was first legalized in California, 20 years ago now). Those wins for recreational marijuana were not a surprise, nor were the wins for medical marijuana in Florida, North Dakota, Montana and Arkansas (now more than half of the states have medical marijuana laws, speaking of tipping points), and President Trump has not been particularly anti-marijuana, so there’s no indication just yet that the federal government will be much more aggressive (marijuana possession and distribution is still illegal under federal law, and marijuana is still a Schedule 1 drug according to the DEA, making it officially one of the most dangerous narcotics they control). So that’s the big claim from Technology Profits Confidential (and others): Marijuana legalization will keep expanding to new states, and riches will flow. Though it’s clear even from the ads that they know there’s not yet really any fundamental basis for making guesses about the size of these markets or the potential profitability of any of the companies… the pitch was largely that the votes would drive investor interest and create huge spikes in some of these stocks and give you a chance to get rich, much like the pot stocks spiked for the last wave of state legalization votes. And I’ll also note that most of the penny pot stocks, including the ones in the “$50 to $2.7 million Blueprint” Blanco noted, fell roughly as fast as they rose after their respective price spikes in the past, so you would have had to be quite nimble to make a profit… and extraordinarily nimble, or lucky, to make a huge profit. And while almost all the pot stocks went up in the Fall in anticipation of the election, many have not done particularly well post-election, which makes sense — the catalyst is past, many speculators “sold on the news,” and now they have to stand up as real businesses and justify themselves based on revenue or earnings or brand value or whatever unique assets or products they can offer. Or, of course, they have to wait for the next catalyst — more legalization votes that get everyone jazzed up, or M&A in the sector, or changes to Federal law, or whatever. “… today’s painkillers are derived from drugs like opium… and morphine. “Which make them very dangerous, too. “According to the Centers for Disease Control, the United States is in the midst of an opioid overdose epidemic. “The truth is opioids killed more than 28,000 people in 2014, more than any year on record. “You see, serious pain drugs are a horrible trade-off — a deal with the devil, if you will. “You take the drug and your unbearable pain goes away… but you may end up addicted (just ask Rush Limbaugh or Brett Favre), homeless or even dead from an overdose. “And that’s exactly why this tiny, publicly traded marijuana biotech firm is so exciting. “You see, they’ve already developed the “next generation” painkiller medication. “… this next-generation painkiller has already cleared Phase 1 and Phase 2 testing with the FDA. “And as you can imagine, in the case of prescription medicines, it’s the first company to market that will hit the largest jackpot…. “… this same company has three other drugs in the pipeline… which are being tested as we speak. “You see, what this company has discovered — through new research — is something called the endogenous system… which is directly linked to a number of physiological processes including pain and inflammation. And a special chemical found in marijuana can regulate the effects of acute and chronic pain. That’s a reference to cannabidiol, abbreviated CBD, which is the non-psychoactive compound in marijuana that has has at least a few researchers interested for decades — there’s growing speculation and some evidence that it might really be CBD, not the better-known THC (which causes that “altered consciousness” from smoking pot), that is the “wonder drug” with potential to help with pain and lots of different kinds of diseases. Without harnessing you to your couch with a bag full of Cheetos and the sudden desire to sit through a Woody Woodpecker marathon. Which stock is this hinting at? There are two reasonable candidates, Cara Therapeutics (CARA) and GW Pharmaceuticals (GWPH) … so the Thinkolator can’t be 100% sure on this one, but I suspect CARA is likely the stock Blanco is focused on here. It’s a $300 million company with a lead product in Phase III for post operative pain (CR845), they had a bit of a hiccup with an FDA clinical hold earlier in the year but that was apparently not particularly serious and was listed and the trial continues enrollment. I’m not sure when they will have results, but they are reporting their quarterly earnings after the close today so it seems very likely that they’l provide an update then on the status of the various trials currently underway. There are lots of other pain drugs that are attempting to get rid of the worst side effects of opiates, and one thing that has apparently been pretty consistent for most of the pain drugs/opiate replacements is that they’ve had sticky moments in their clinical trials. I don’t know how CARA will do, but I do think recreational marijuana is largely irrelevant to their prospects… and, as you might expect, the stock is not really moving up into the election like all the sketchier pot stocks are. GW Pharma does have more of a connection to pot legalization trends, at least in the eyes of investors, partly because they have gotten some credit for developing their own strains of the marijuana plant as part of their drug development, and it does get mentioned in almost every mainstream marijuana article because it’s by far the biggest company in the business, with an approved licensed drug and a $2.5 billion market cap. There’s also some notion that marijuana legalization just makes it easier to do research on marijuana-related drugs, since that would mean less regulatory control of the research process (doing R&D with schedule 1 narcotics is more strenuous than with other compounds, and, bafflingly, marijuana remains a schedule 1 drug despite widespread legal medical use — schedule 1 is supposed to mean that there’s no safe or medically advisable way to use the drug, which might make sense with heroin or MDMA but seems silly for marijuana). I don’t buy it, you may be interested in GWPH because of their drug development pipeline (which happens to use compounds derived from cannabis), but whether their drugs are safe and effective is the big deal — marijuana legalization would perhaps have some potential to be bad for them, but I don’t see any big reason why it would be particularly good in a meaningful financial way. By “legalization being bad” for either Cara or GW Pharma, I just mean that it creates some competition in the pain med space… would your doctor suggest taking legal over the counter marijuana, or using a prescription drug derived from marijuana? Would you maybe not even go to the doctor for pain meds if you could get marijuana legally, cheaply and easily? That doesn’t mean cannabis-derived drugs or synthetic cannabinoids can’t be wonderful, and they would certainly be much more predictable and controlled and specific, in terms of dosage of specific chemicals, than recreational marijuana, it’s just that I don’t see a positive impact from legalization for the cannabis drug developers and I do see a possible negative impact. The other company that you might plausibly throw into the mix there, interestingly enough, is Insys Therapeutics (INSY), which has an opioid pain drug called Subsys (a version of fentanyl) that’s currently in use but is also developing some cannabis-related medications. That’s a stretch, and it looks like INSY is actually nervous enough about the negative impact of marijuana on its business that it is the major backer of the “no” vote on recreational pot in Arizona. What else is hinted at in the ad? They’re based in California, and they’ve quickly become America’s premier supplier of packaging, accessories and branding solutions for the legal cannabis industry. “In just the past two months, share prices have climbed over 212%… but if California votes to legalize recreational marijuana (and the latest polls are showing it will)… this is just the beginning. That’s a little company called Kush Bottles (KSHB), which sells mostly packaging (like child-resistant packages to meet regulatory requirements) and branding — which is interesting, because I don’t think we’ll see the rise of “real” marijuana companies until regional branding really starts to kick in. And yes they are a fast growing company (they made the Inc. 5000 list last year), and they do have an actual business that’s making sales. They even have a patent application for a particular variety of childproof bottle — though I wouldn’t overstate the impact of that, there are hundreds of different successful, in-the-market designs for childproof bottles and packages in the pharmaceutical industry. They have been roughly breaking even in recent quarters, with revenue growing pretty dramatically, so the business looks reasonably sustainable but would probably need more capital to grow dramatically… and, of course, the market is valuing the company as if they will grow dramatically. Right now, according to their latest financial press release that came out today, Kush Bottles has good revenue growth, still growing about 100% year over year (slower growth than in past quarters, but still good), and they probably have pretty strong revenue growth potential, largely because of the expected approval of recreational marijuana in California, where they already have a toehold in the medical marijuana packaging business. But they’re also a packaging company, which means I would expect their profit margins to contract considerably as the business gets larger, and they have a market cap of about $175 million dollars. That’s a hugely rich valuation for a “real” company with $8 million in annual sales and a breakeven income statement, even if they’re going to double sales every year for the next several… so you probably really need to assume that they will get a windfall of business from the next wave of legalization that grows their revenue dramatically faster, or you have to assume that they will become the dominant provider of branded marijuana packaging and that many more of the current producers will go to Kush Bottles over their competitors. I assume that’s the goal of the company, but there’s also tons of competition and a rapidly shifting regulatory environment, so there is a bit of a race among the packaging companies to get to scale and try to build a dominant market position. 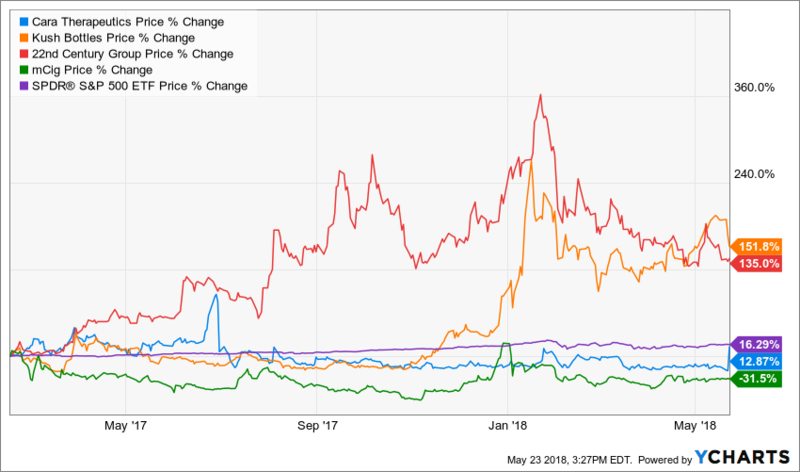 I have no idea whether Kush is doing better than competitors like Cannaline or Funksac or Cooljarz or any of the others, since most of the competitors are not publicly traded. Being the only publicly traded company in a sector is not the same as being the only company in a sector — being publicly traded might give you easier access to capital, but it tends to give some investors the mistaken impression that they’re buying into a monopoly just because there are no other stock tickers in that particular segment of the business… so be careful. Kush Bottles may well soar if California votes “yes”, I’m not sure, and they could even grow into a strong company if they’re able to take a lot of market share for a growing sector and hold onto it nice and tight — but I can’t convince myself to buy a $175 million packaging company with sales of only $7 million, even if they have good growth. “Because of the small size of this company… and the unique angle they’ve taken with medical marijuana, I can’t go into much detail right now. “However, I can tell you that they were just awarded a medical marijuana sublicense to a patent from the U.S. government… and they have 20 more marijuana patents currently under review. “This small firm — that currently trades for around $1 per share — could easily become a global leader in marijuana biotech. “Some of the largest investment groups on Wall Street are buying huge swaths of shares. This one I can’t be completely certain about, but the best guess from the Thinkolator is that he’s teasing 22nd Century Group (XXII), which is an agricultural biotech company developing new strains of both tobacco (lower nicotine, etc.) and marijuana (lower THC, higher cannabidiols, other customization). The clues fit pretty well, it trades around a dollar and has some institutional ownership (unlike most of the penny stocks), and it did recently (two years ago) license one patent and 20 patent applications from Amanda Laboratories that have to do with the expression of four different genes in the cannabis plant. They would like to use this license to develop strains of marijuana that are either very high in THC or other cannabinoids, for the medical marijuana market, or very low in THC as they hope to build a market for hemp products that can escape government marijuana regulation. They explain this basic plan and their cannabis/hemp technology here, but they also announced an expansion of this business in September (the various “Projects” of their Bontanical Genetics subsidiary are listed here). Part of the plan is that they intend to produce cannibinoids in tobacco plants, not marijuana plants, which they say might speed up the commercial timeline considerably. The renenue-generating part of the business, however, is low-nicotine cigarettes, including those sold under their Magic, Red Sun and Moonlight brands. They’re trying to build this business, both with their own manufacturing and with licensing their ultra-low-nicotine tobacco to other producers, and sales have ramped up pretty dramatically over the past year (more than doubling), but their revenue doesn’t yet cover the cost of goods (let alone the R&D or overhead costs) so they clearly need much more scale. I don’t really know what the uptake potential is — what would really be meaningful for XXII is a regulatory push to require much lower nicotine cigarettes, or to ban high nicotine cigarettes, so they talk a lot about those regulatory possibilities around the world. They have raised about $15 million over the past few months with two equity sales, so their balance sheet is better than it looks in the last reported quarter, but I have no idea how long it will take for them to really get to commercial scale with their lower-nicotine cigarettes… and the marijuana stuff is still in the lab, so that’s not going to have a meaningful impact within the next year or two (at least). I’m not at all sure that XXII is the match for those clues, but it’s the most reasonable match we’ve got today. And it is, at least, a real and functioning R&D company that has some marginal possibility of a substantial medical marijuana business in the future. I can’t see how more legalization votes would have a direct impact on their business, but generally it should be good for them, in the long run, if medical marijuana becomes more widespread. The stock did pop higher in the early 2014 run that tool all medical marijuana stocks higher, so who knows, maybe that will happen again… but beyond any optimism about the growth of their cigarette business there isn’t any real fundamental reason for the stock to pop higher at the moment, unless you want to bet on them being able to develop some great new cannabis plant strains (or cannabinoid-producing tobacco strains) over the next few years that will enjoy tremendous commercial success. You see, as any marijuana aficionado will tell you, growing marijuana indoors offers a number of key benefits. It allows you to closely regulate light, temperature and humidity. It also offers an element of privacy and protection. “As marijuana becomes legalized across the country, the market for indoor growing accessories will explode… and this penny pot company is the industry leader. OK, so I have no idea which stock this is. But I take some solace in the fact that any argument for whatever stock it is seems likely to have no fundamental basis whatsoever, though you never know what will happen to a stock during a speculative bubble. Hydroponics and indoor growing equipment has been a growing business for decades, and there are lots and lots of private companies and large agricultural suppliers selling indoor grow equipment — including some who have gotten their marketing and website technology out into the lead and no longer look like online gardening catalogues from the 1980s… but there is nothing proprietary in any of this and I think it’s about as likely that there will be one dominant, fortune-making “indoor growing” company as it is that there will be a one dominant home brewing company for beer enthusiasts. Small indoor agriculture suppliers aren’t going to win the business of any potential massive new (legal) pot growing operations in California, I would assume, any more than Tractor Supply Co. sells baby chicks and bags of fertilizer to Perdue or Tyson farmers… and hobbyist growers have lots of providers to choose from. See, I told you I was going to be skeptical and a little bit grumpy! “This $0.39 Marijuana Stock Expected to Announce ‘Record-Breaking Quarter’…. “… it was recently revealed that they are expected to deliver “the best quarter on record” to shareholders. “All three segments of operations — construction, wholesale and retail — are being reported as profitable and self-sustaining. That doesn’t really mean all that much, of course — it’s a brand new industry, at least legally, so if you’re a marijuana-related company that benefits even indirectly from either medical or recreational marijuana legalization and growth, the business should be growing fast enough that just about every single quarter at this point should be “the best quarter on record.” There’s no point in being in this business if you’re not growing at breakneck speeds — just about no one seems to be really making money, they’re all desperately trying to build market share. And if we assume that they’re still focusing on the same four stocks, then logic argues that this clue must relate to that unidentified (by me, at least) fourth one they’re talking about in the email — none of the others have been anywhere near 39 cents a share in the recent past. So what does the Thinkolator say? Well, without any great certainty we do get pointed at a likely candidate: mCig (MCIG), which until 2013 or so was called Lifetech. Why is it a match? Well, MCIG does have those three divisions — construction, wholesale and retail… though they are renaming their operating segments construction, CBD, and e-Cig operations as of this next quarterly report. And they did pre-announce a record quarter just last week (their quarter ended on January 31, they say they’ll be filing their 10Q before their conference call on February 28). And yes, the price clue matches — their average share price over the past month or so has been in the 39-cent neighborhood (it was at 10-15 cents around the time of the election). There isn’t a particular April 15 connection here that I’ve noticed, but otherwise MCIG is the best solution we have for the available clues. And it has done better than most such stocks since the election — this is now a $100 million company, believe it or not (the market cap was under $10 million as recently as September), and they imply that they are (just barely) profitable off of their roughly $2 million in annual sales, though that seems largely to be because their high-level employees are being paid primarily in stock. The construction business is new, started last year, and that’s the “growing” part — they help build pot farming operations. That division loses money so far. The CBD business is basically cannabis e-cigarettes, and the third division is VitaCig, which is a wholesaler of leaf-based e-cigarette stuff. From my skimming of the financials, it looks like they’re now making a little money … but that there’s no rational way, at least in my book, to say that this company should be worth $100 million, the assumptions about growth are just too high. They did announce early in 2017 that they’re trying to reduce their outstanding share count by converting some “major shareholder” shares into preferred stock with two-year lockups, so that might be a good thing (I don’t know what the terms are for the preferred shares, and haven’t gone back to see if they actually did what they planned). If you’ve got an “indoor marijuana growing” company you’d like to present to the class as a better match, please do so with a comment below — and, of course, we’d all like to hear if you have favorite stocks in the marijuana space either as “real” investments or as speculative trades on another bubble forming that echoes the previous spikes of the marijuana penny stocks. I can’t seem to get myself enthused about any of them, but that doesn’t mean you shouldn’t… so feel free to spread your enthusiasm below. Thanks for reading! 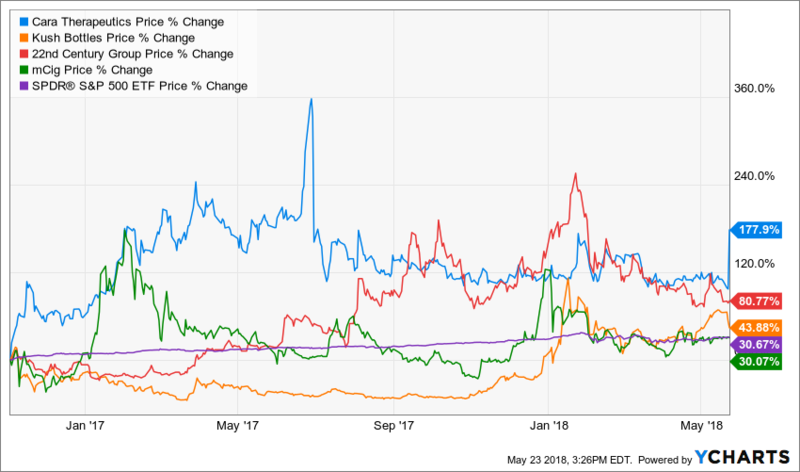 That purple line is the S&P 500, so you can see that Kush and 22nd Century have done well recently, Cara and mCig not so much but they did well for periods earlier… and they’re all quite volatile. Enjoy! 417 Comments on "What’s the “Secret ‘$50 Marijuana Stock Blueprint'” Pitched by Technology Profits Confidential"
I would forget about that with Agora, I had sent 4 emails to Ray Blanco never got one reply. I just canceled today with them. I’m going with Matt McCall. Also heard the whole marijuana thing with Blanco is a scam.